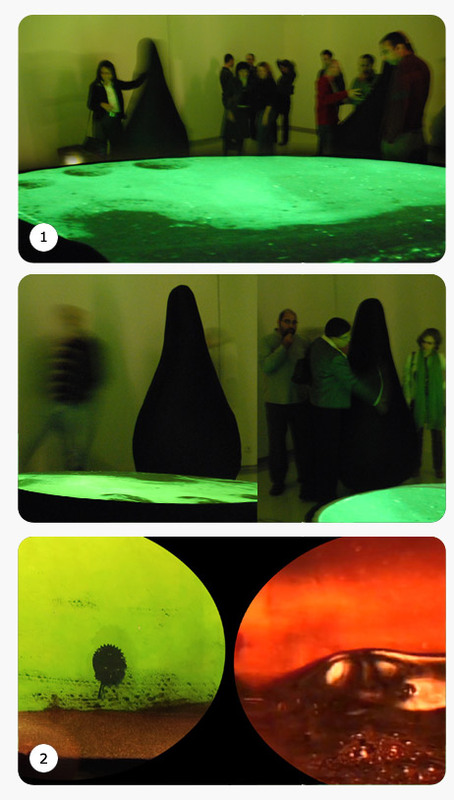 Susurrus is an interactive video installation. It enables users to influence a remote ferrofluid** tank by tilting and hugging man-sized input devices. According to the strength and direction of the hug distant robotic arms are affecting the liquid inside the tank. The result is photographed and streamed to a video projection that is positioned in front of the viewers. Operators are able to pull and guide blobs of black liquid across the video plain. The physical location of the operators around the projected pool - influence the angle and stability of the projected landscape. When working together and managing to create blobs that touch each other the system becomes stable and records the generated blobs. The System supports and encourages the visual communication between the two operators gratifying them with the inclusion of their momentary creation in the ever growing collection of agitated blobs that are generated through several levels of mediated touch. ** The projected liquid is Ferrofluid. Part liquid, part solid, Ferrofluid is made out of tiny particles that respond to external magnetic, gravitational and surface tension forces. When put in presence of a magnetic field the liquid expresses the form of the electro magnetic field. When the field is removed it returns to its former state.